The Egyptian president has issued a law that broadens the state’s definition of terrorism to include anyone who threatens public order “by any means,” and gives authorities powers to draw up lists of alleged terrorists with little judicial recourse. Under the new law, prosecutors can name someone a terrorist, freezing their assets, and barring them from public life or travel, with only simple approval from a panel of judges, and without a trial. The listing is valid for three years and can be renewed. The legislation was signed in the form of a decree by President Abdel-Fattah el-Sissi last week and was distributed to reporters on Tuesday. It is part of the government’s stepped-up campaign against an expanding insurgency by militant groups, including one that has pledged allegiance to the Islamic State group fighting in Iraq and Syria. The authorities have also waged a sweeping crackdown on supporters of ousted Islamist President Mohammed Morsi, as well as young activists and groups that fuelled the uprising that toppled autocrat Hosni Mubarak in 2011. Internationally, Egypt has pushed allies for closer cooperation to combat terrorism in the region, particularly in neighboring Libya. Rights activists criticized the law, saying it only serves to expand Egypt’s existing arsenal of legislation that empowers authorities against political opponents. Egypt has been without an elected parliament since 2012 when the last elected house was dissolved by a court order. 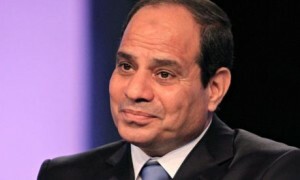 El-Sissi has the power to approve new laws in the form of decrees. Zaree said such a broad definition could leave anyone — including even a political party calling for a protest or criticizing the government in a statement — subject to the law. In Egypt’s penal code, terrorism is already broadly defined as an act that endangers public order. “This definition of terrorism can now be applied to the Islamic State or to us,” Zaree said, referring to the rights community, which is highly critical of the government’s human rights record. The new law is likely meant to replace emergency measures that Egyptian police and prosecutors have operated under for 30 years. Those measures already overstepped existing legislation, giving authorities broad powers to detain and arrest suspects, and leaving the public mistrustful of their ability to follow the law. According to Zaree, the new law effectively narrows public space, and also serves to “cover up” Egypt’s unsuccessful effort to defeat terrorism. Probably necessary but easily abused.